Way back in 2004, looking for inspiration and doing our part for the economy, we bought a little guidebook called "Corse, lÎle Verticale". Well it has taken us some time to finally get there. For better or for worse our visit coincided with some truly nasty weather in Mediterranean, with a persistent low often centered directly over, you guessed it, Corsica! With the low right overhead, the rains would sometimes come from the east, sometimes the west, and on some days, both. But we did manage to get some climbing in, some of it actually very good. But we spent quite a few hours cruising around in the car, taking in the sights. The night ferry to Bastia. This one departed from Savona, only about a 4 hour drive from home. Splurging! We decided to rent a cabin. Actually, it was quite nice to be able to shower and get some sleep. Lots of (mostly more youthful) folks, however simply curl up in a corner in a hallway somewhere. Our first taste of Pietra, the local Corsican brew. Some 10 hours later, As we approach Bastia, the sun rises over the Island of Elba. Elba was Napoleon's first island of exile, where he spent about a year before returning to France and his ultimate defeat at Waterloo. Coming into Bastia. The small boat in the foreground has just dropped of the pilot, to help with the rather complicated and impressive maneuvering required to dock our ferry. We more or less drove straight to Corte, where we managed to find an open campground, Camping Saint-Pancrace. Much of Corsican tourist trade shuts down at the end of September, so we had lots of sites from which to choose. The main difficulty is finding an open campground. With much of the day still ahead of us, we decided to "go for it" and do a climb. This is the Punta Spenicazzia, a tower partway up the nearby Restonica Valley. We did a fun 5-pitch route called Candella di l'Oro. This climb was our first exposure to the amazing eroded rock formations called tafoni. Super fun climbing, and surprisingly, really clean and solid. Our route more or less climbed up the middle of this vertical wall. The next day was pretty grey and drizzly, so Kathy visited a wool and textile museum while Mark wandered aimlessly. The Golo river near Ponte Leccia. The next day (I think it was) we decided to pack up camp and move down to the "Grand Sud". We took a very scenic, but very winding route to Zonza, then over the Bavella pass, continuing down to the east in search of an open campground. Finally we found one in Pinarello, hot and humid on the coast. This photo was taken mid-drive as we stop for a bit of lunch. The next day, the weather looked slightly better, so it was back over the Bavella pass to set up camp in Zonza at the very pleasant Camping Bavella Vista. 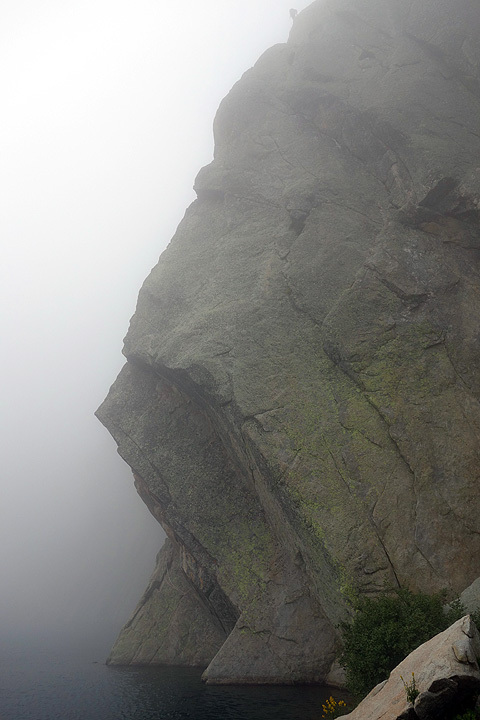 We then returned to the pass and started off to another Corsican classic, the Arete de Zonza seen here. Well, soon after we started up the first pitch, the clouds came. But it stayed dry for the entire climb, some 11 pitches. Here is Kathy on the summit. Fortunately we managed to find the rather tricky descent route in the mist. Hiking back through the woods to the Pass. ....and arriving back at the car. All alone in the parking. The weather was so variable it was really hard to plan. Often mornings were better, but almost invariably it would cloud up before noon. Morning sunshine in the campground. On one rather discouraging day, we drove west, to what we hoped would be drier weather, to the Col de la Tana. We managed to do a couple of really good pitches before the rains finally found us. You can see them lurking in the background. The next day, I think it was, we went back up and over the Bavella Pass, and climbed La Perillat on the Castellucciu. Here Kathy climbs up the somewhat tricky first pitch. Though the rock was excellent, route-finding was not obvious, complicated by the fact that Mark forgot to bring the description from the excellent book "Grandes Voies de Corse". But I think we more or less did the right line. On the summit of the Castelluciu. The Bavella pass is hidden in the cloud in the background. Hiking back to the car in the hot and humid weather. Later that day, we drove back to Zonza in an amazing downpour, took some coffee at a local bar and checked the weather online. It seemed that things might be a bit better to the north, and plans were laid to head back to Corte the next day. Once again we set up out little home in the Camping Saint-Pancrace. And again, with most of the day ahead of us we decided to try another climb. Some of the "wildlife" on the hike into the Tavignanu valley. Our objective was a route called "Ombre et Lumière" on a formation known as the Rossolino. A very pretty walk in, if a bit long. Here's Kathy on the second pitch. Great rock. This pitch is followed by a very steep pitch with lots of rounded holds, a bit challenging for me, I'll freely admit. And of course, at the base of the 4th pitch the first wee raindrops started to tickle our skin. But after a short wait, it seemed that it would not amount to much and we were able to carry on. And at the top of the 4th, rather more difficult pitch. This was a really good climb, probably our best in Corsica. We managed to finish the climb and even hike out without getting very wet. The last 100 meters to the car. It looks like it rained here during the day. Kathy picks up email and podcasts at the Corte tourist office, closed at the moment but the wifi is still on. Mark wanders around taking photos. This one of the Citadel in Corte. And another beautiful morning in our lonely campground. On this day, we decided to try one of the area classics, "Symphonie d'automne". It is a good 2-hour hike into the route, but the weather looks good, at least to the east. As we get closer to our objective, the clouds are already beginning to threaten. And we arrive at the base of the route, rising out of Lac de Capitellu just as the first drops of rain start to fall. We drown our sorrows over a beer in Corte. The next day, our last full day in Corsica, dawns more or less sunny. We debate over breakfast whether to take up yesterday's plan once again, or do a big driving tour around the west side of the island. Tired legs win out and we pack up the car. In the end, as we leave Corte, we see that the snow level during the night has come down quite far, most likely below the level of the climb. Relieved to have a justifying excuse (even though the decision had been made), we drive west. From Corte, the logical route over to Porto is over the D84 through Ponte Castirla. But, upon arriving at Castirla we find that the road is closed for the day, for the venerable Tour de Course Historique, a road rally. So a rather large detour was called for, back to Corte, south and over to Ajaccio. Finally we get to the part of the coast we were really after, the section between Piana and Porto, a UNESCO World Heritage site. The little town of Porto. Capo Biglione, not far from Calvi. We stop in Calvi for a break and to wander the old Citadel. The Cathedral St-Jean-Baptiste in Calvi. And more Calvi. We continued our drive Back to Bastia, finally arriving at our home for the night, the Camping San Damiano. And early the next morning, we are back on the ferry for Nice. Sun coming in low in Bastia. We leave behind another rainy day, it would appear. Oddly enough, we return home to Chamonix to find 5 centimeters of snow in our yard. We shouldn't be surprised I guess. So, a week or so later, after the world has had a chance to dry out, we are back at our "local" crag, the Corma di Machaby. We spent a productive afternoon on this great hunk of rock. This time, we did 4 excellent pitches, the first two on "Maga Mago" and the last two on "Free Volezze". The last rappel to the ground as the sun goes behind the mountains on the far side of the valley.